2. 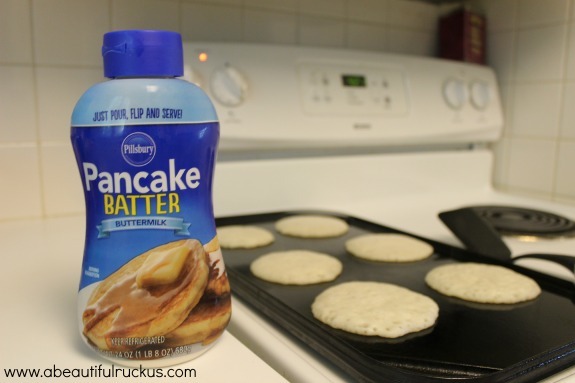 Pillsbury Pancake Batter Surprise! Did you see the post I wrote a few days about about Mini Chicken Pot Pies? Well, Pillsbury surprised me with a coupon in the mail for a free bottle of their new pancake batter! I really love trying new things, and since we have breakfast for dinner so often, this was right up my alley. It's pre-made batter, so you just shake it, pour, cook, and serve. Dinner was on the table in record time last night. 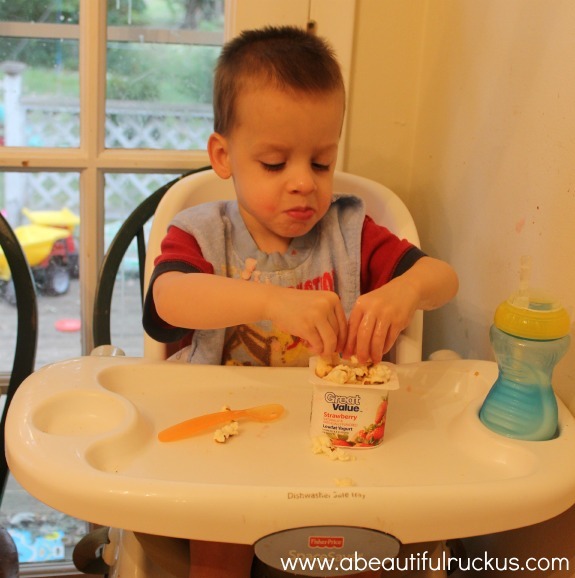 I can see the appeal of this product as there is no mess, no prep, and it's very convenient. The pancakes were good, although quite a bit flatter than homemade pancakes. The only major downside is that it would take two bottles to fully feed my family at just over $4 per bottle in the Midwest. But, if you are short on time, this might be something you would want to look into! Thank you to Pillsbury for letting my family try their new Pancake Batter! 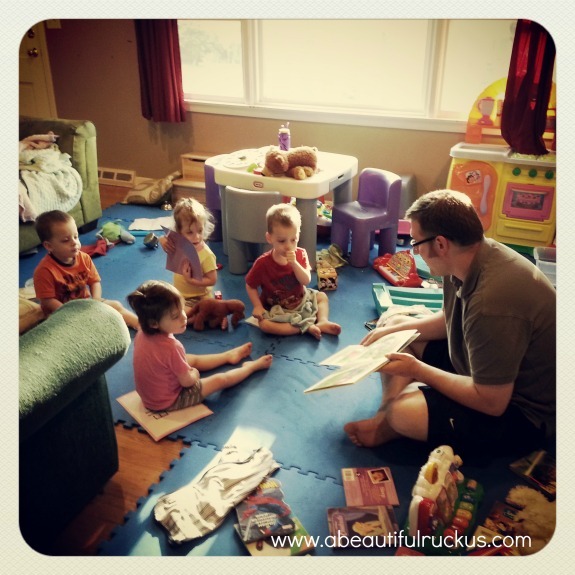 Sean was delighted to find out what my latest product review item is! 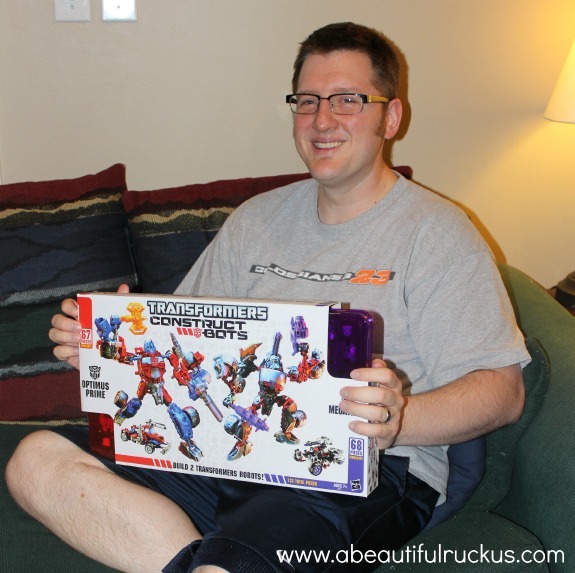 My hubby is a huge Transformers fan, so I pretty much just handed the box to him and let him play with it. He waited until the kids went to sleep, and then put together the Transformers Construct-Bots Optimus Prime vs. Megatron Construction Set. He said it was a lot of fun and probably appropriate for ages 7 and up (in other words, our kids would still eat the pieces or push them up their nose). This review item is from one of the product review companies I participate in. I'm doing a three part series highlighting the different websites. Although this isn't the company I got it from, if you want to read about how we get free products to review (no blogging necessary), you can read the first part HERE. Some junk mail showed up at our house this week. I pitched the ad, but let the kids have the sticker sheet that came with it. 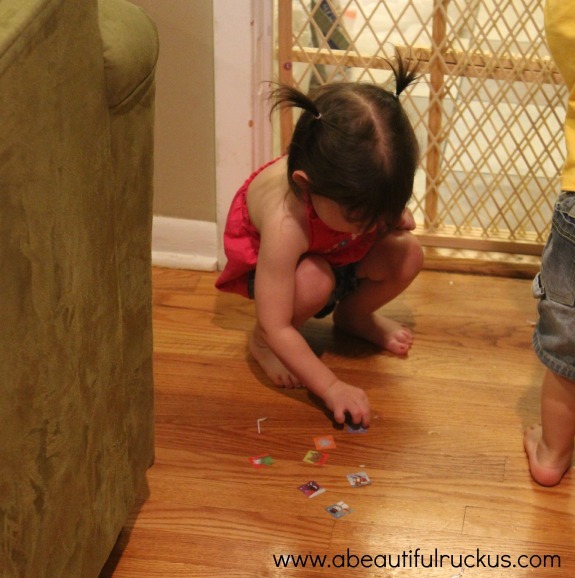 Next thing I know, there are stickers carefully stuck to our hardwood floor. Elijah and Abby had systematically removed all of the stickers and put them on the nearest object. Ellie, ever my child who wants to put thing where they belong, decided that the floor was NOT the place to leave stickers. Last night after dinner, she pulled each sticker up and gave them to Daddy for safe keeping. Click the picture to make it bigger if you have too! 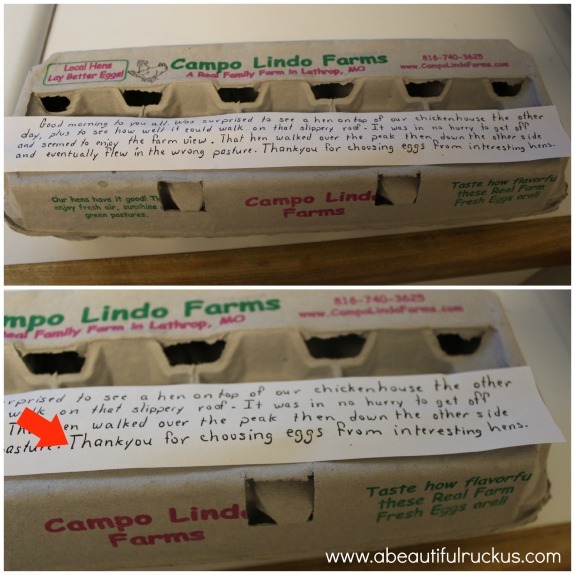 When eggs come in our CSA bags, they often come with a little note from the farmers about what's happening on the farm. This summer, they've put in a new chicken coop, had a lot of water, and random other things. But this note is my favorite! I think it's adorable and funny! Read the part that the red arrow is pointing at! 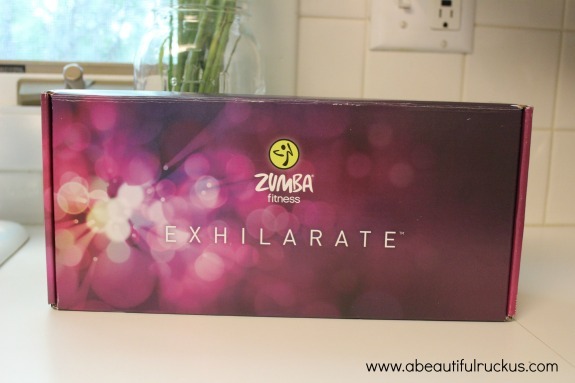 I found a used copy of Zumba Exhilarate on Amazon and used a gift card to purchase it this week. So...I guess this means I need to start working out now? Practice, practice, practice! We will get this Preschool Church thing down! Thanks to all of your comments, suggestions, and encouragement when I publicly freaked out in my post about the trials and tribulations of going to Sunday School. I think my husband would be equally giddy about that Optimus Prime set! haha! That egg thing is just too cool! And wow, I think I'd even like to play with that Transformers set. My son would love the transformers to as well.